Although they don’t use the tabard, this set of outfits that I made for my secondary Monk to show dedication to each of the August Celestials also belongs in this collection. The details on the sword of the August Sentinel, gosh. 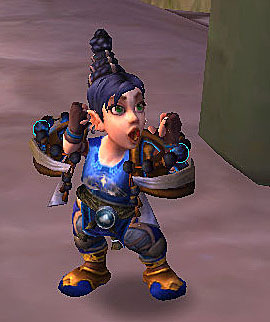 That Gnome expression was just too amusing! Tauren turn into Gnomes and Gnomes turn into Tauren with the Orb of Deception. If I’m remembering correctly, the other pairs are Orc/Human, Undead/Night Elf, Troll/Dwarf, and Blood Elf/Draenei. I’d have done Undead/Human, Orc/Dwarf, and Troll/Night Elf, though. That sword was one of the reasons why I did LFR with my Warrior and Paladin during Mists! Keep going with that Archaeology! The parasol is worth it! I love your celestials’ sets. Especially “Niuzao’s Fortitude”. Great job!